In a row with Bill Gates, Al Gore or Jane Goodall in the past, Johanne Patry of Science on Stage Canada has presented a talk at this year's TEDx-conference in Montréal. TEDx is famous for bringing together thinkers of today giving them a chance to present their ideas for society on stage. As if this hadn't been enough, Johanne Patry has also been interviewed for La Presse, one of the biggest francophone newspapers in Canada. There she stresses the importance of the exchange among teachers via Science on Stage. It was not just taking, it was also giving something back, which is motivating for everyday life. Read the full article (in French) at La Presse online. This is an amazing idea how to build your own microscope based on a smartphone, a lens and a flashlight with your students! Simple and cheap if you possess a smartphone and the results are truly impressive. Find a step-by-step construction manual on instructables.com. Apps for rollercoasters, stars and songbirds: The first workshop to the upcoming Science on Stage Germany brochure 'iStage 2: Smartphones in Science Teaching' was held from 19-21 October at SAP in Vienna. From 14 countries, 22 science teachers gathered to define the topics of the publication and to work practically on the first results. Find pictures of the iStage 2 meeting in Vienna on facebook! Amongst the projects are great approaches with measurements of height, magnetic fields, measurements of parallaxis, location of songbirds or acceleration on rollercoasters by using a smartphone. After an introduction into the project iStage 2, the teachers got together for brainstorming and clustering the topics. The coordinators of the project allocated head topics to the teacher's ideas, which apps can be usefully integrated into physics, biology, chemistry, mathematics and astronomy classes. Working titles of the teaching units are apps for eyes, ears and hands. In the following days, the teachers specified their teaching projects in group work and presented their ideas afterwards. The teachers will script their ideas and field-test them until March 2014. The publication "iStage 2" then will be out in December 2014. How often have you rejected silly student's excuses? 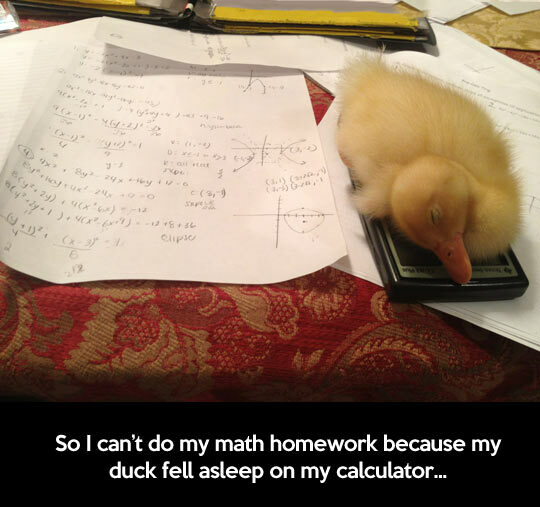 What about this one: "I couldn't do my homework because my duck fell asleep on my calculator..." As it seems, this one was true!